"Constellations" is an acrylic painting on a square format stretched canvas measuring 20" x 20" x 3/4". This painting is not framed. The emphasis is on sky at night and constellations. Some ground line or water line has been kicked up but that is low keyed. You are still viewing a color field of blue, but there is movement, but not movement that is screaming with tactile paint. Allow yourself to be pulled into this piece and identify your constellation. This is stretched on the narrow stretched canvas frame. I find this a bit easier if I want to place it in the rabbet of a frame, but still can be presented beautifully in a floater frame. "Petrified Rain" is an acrylic/ silicone abstract painting on stretched canvas measuring 20" x 16" x 1.5" deep. This painting can be framed, or hung without a frame. It is already wired. 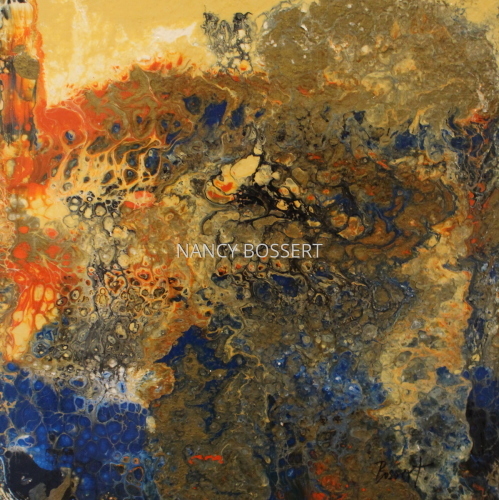 This piece is loaded with color, texture and movement. The color combination encompasses yellow/green, brown, blue, whites and orange with a mix that could replicate a weather storm map or visualizing the high seas during a storm. Take solace to be on safe ground and focus on the coloration and movement. Use as the wonderful pop of color, but not the in your face color but muted coloration that happens in a wonderful garment that touches all the right curves. 6.25" x 5"10" x 8"13.75" x 11"17.5" x 14"21.25" x 17"26.25" x 21.25"
"Black Forest", is an oil painting, abstract, that deals with my love for viewing landscape and the memories attached to certain places. 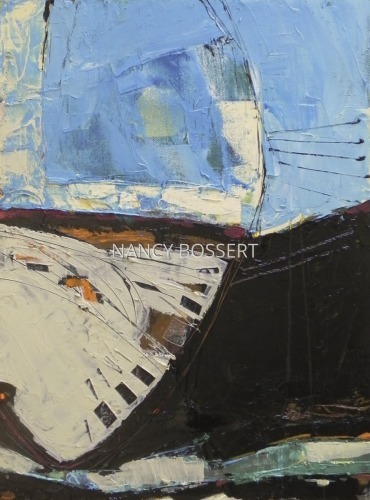 This painting is oil on stretched canvas and has a lot of visual and tactile texture. The painting measures 8" square but is framed in a black wood floated frame which gives the final measurement at 11 3/4" square with a depth from the wall at 1 3/4 ". This is wired and ready to hang and a wonderful mate to "Railway"
"Railway", is an oil painting, abstract, that deals with my love for viewing landscape and the memories attached to certain places. 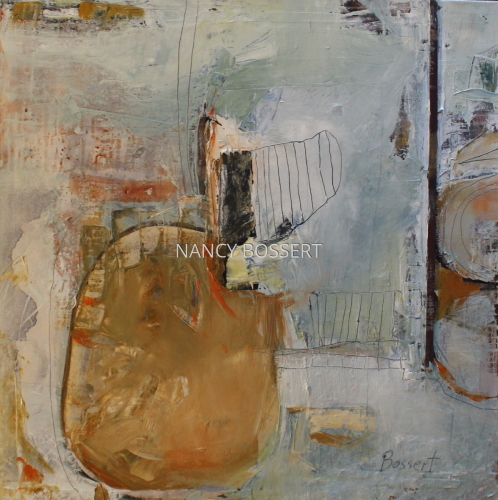 This painting is oil on stretched canvas and has a lot of visual and tactile texture. The painting measures 8" square but is framed in a black wood floated frame which gives the final measurement at 10 1/4" square with a depth from the wall at 1 3/4 ". 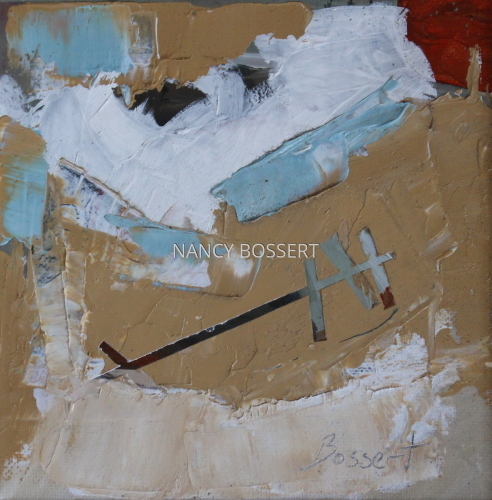 This is wired and ready to hang and a wonderful mate to "Black Forest"
Artspan offers a wonderful option in the print area to view how a piece of art might look in many different frames and matting choices. Whether you only want to purchase the original this opportunity even will show how the art work looks on different colored walls. Go into prints, there is no obligation to purchase a print and have fun playing around. 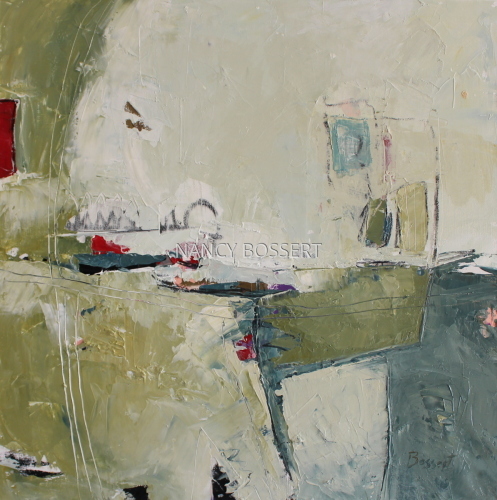 "Son Rising", is an oil painting, abstract, that deals with my love of abstractions and the stories attached to them. The painting process becomes emotional and very quiet, and intense for me. 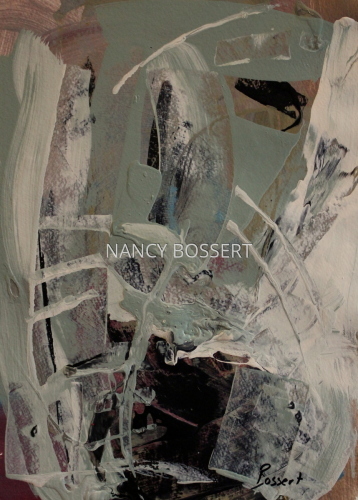 You might want to view my blog where I break down some of my piece, nancybossert.blogspot.com. I am always willing to answer questions, so never hesitate contacting me. 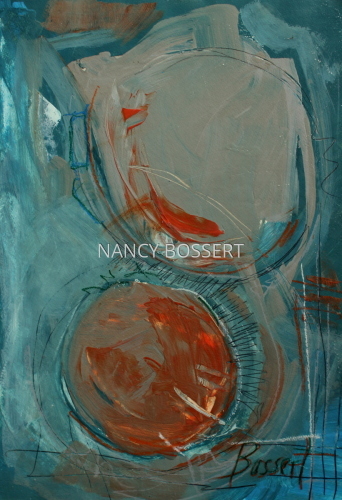 This painting is oil on stretched canvas and has a lot of visual and tactile texture. The painting measures 20" square and is 1 1/2" deep. Currently this is not framed, nor does it need a frame. This is wired and ready to hang and enjoy. "Cradling Thoughts", is an abstract oil painting on stretched deep canvas measuring 24" x 30" x 1.5". Stories always lie within an abstraction, so immerse yourself in the strokes, textures, coloration. The cools out way the warms but create a push pull tension that allows the eye to move freely within the piece. This is a horizontal presentation. No framing is required, but a floater frame could be used if desired. Check out the wonderful options artspan offers through their print options. You may only want to purchase the original, but this gives you great ideas on framing and viewing the piece on a wall! Thank you Artspan! 5" x 6.25"8" x 10"11" x 13.75"14" x 17.5"17" x 21.25"21.5" x 26.75"
"Separation Move" an abstract with a story. My strokes, my paintings, always have a meaning, maybe you need an explanation or must read between the lines, but a story lingers, a narrative lives on the canvas. For me it isn't just the paint and balance, there is an emotional story tied to every piece. Enjoy. oil on canvas. With a figurative piece it might be easier to reveal a story line, a poetry of figure in the positive and the negative. With all my art, I get lost in the paint, the process the imagery the iconography. 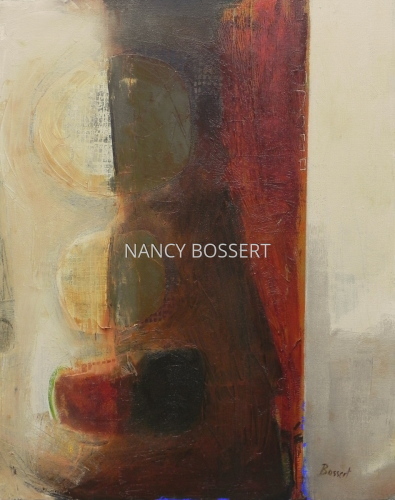 With abstractions It is the linear and mass, the shapes and form that I begin my emotional journey. This happens to be a move that family is making from our location. My art becomes my best medicine. How I can process and reconcile feelings, how I fraction off the families and know that there are still passages to one another, that we will never be left alone. I never wrote or shared the thoughts behind a piece until I was asked to do so recently. 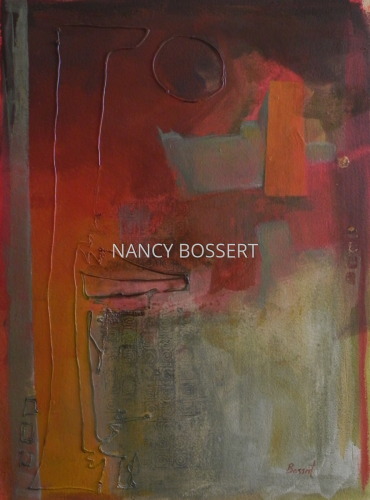 This is a pleasant size piece a 30" x 24" x 1 1/2" deep. Enjoy unframed, but if you desire a frame, I would recommend a floater frame. Also play a round with the frame option under the print shop, even if you want the original, it is a wonderful tool that artspan offers. I have also ventured, or got my toes wet with Vida, a clothing and house hold line of art, find me there. This piece you can find and purchase there as a glass dish or a clothing wrap that looks so.. cool, I can't wait to get one! "Counting Sheep" an abstract with a story. My strokes, my paintings, always have a meaning, maybe you need an explanation or must read between the lines, but a story lingers, a narrative lives on the canvas. For me it isn't just the paint and balance, there is an emotional story tied to every piece. Enjoy. oil on canvas. With a figurative piece it might be easier to reveal a story line, a poetry of figure in the positive and the negative. With all my art, I get lost in the paint, the process the imagery the iconography. 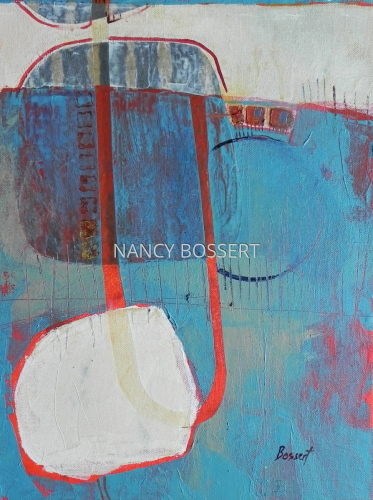 With abstractions It is the linear and mass, the shapes and form that I begin my emotional journey. This happens to be a move that family is making from our location, coupled with a medical issue in the family. My art becomes my best medicine. How I can process and reconcile feelings, how I fraction off the families and know that there are still passages to one another, that we will never be left alone. I never wrote or shared the thoughts behind a piece until I was asked to do so recently. Many sleepless nights, when getting up and painting relieves the stress and allows the movement of strokes to take over. The recognizable hub of the family is still intact as the rectangular image dissolves and becomes solid. 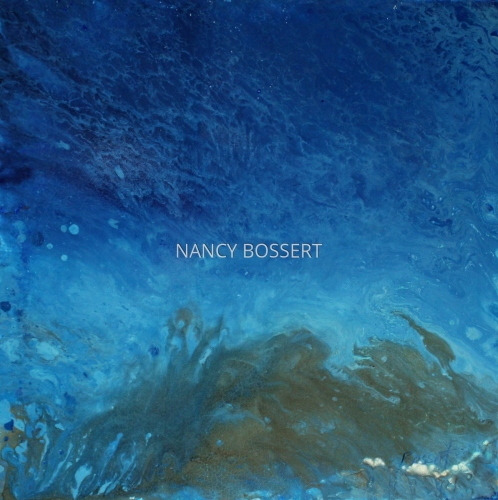 or my blog nancybossert.blogspot.com which can be accessed right through my artspan menu. I have also ventured, or got my toes wet with Vida, a clothing and house hold line of art, find me there. This piece you can find and purchase as a glass dish or a clothing wrap that looks so.. cool, I can't wait to get one! 8.75" x 7"10" x 8"11.25" x 9"13.75" x 11"16.25" x 13"19.25" x 15.5"
"On the Outside" an abstract with a story. My strokes, my paintings, always have a meaning, maybe you need an explanation or must read between the lines, but a story lingers, a narrative lives on the canvas. For me it isn't just the paint and balance, there is an emotional story tied to every piece. Enjoy. oil on canvas. With a figurative piece it might be easier to reveal a story line, a poetry of figure in the positive and the negative. With all my art, I get lost in the paint, the process the imagery the iconography. 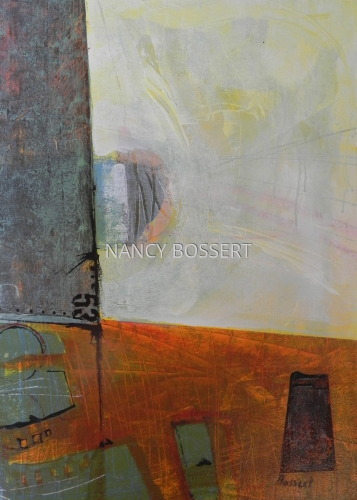 With abstractions It is the linear and mass, the shapes and form that I begin my emotional journey. This happens be a medical situation with the very youngest in the family. WE all have issues, large and small that are stressors in our lives, I am so fortunate to be able to turn to canvas, brush and paint to feel out those situations. I can become quiet and intimately involved with my thoughts and contemplate the actions. I can feel and translate the sorrows and the triumphs. My art becomes my best medicine. How I can process and reconcile feelings, how I fraction off the families and know that there are still passages to one another, that we will never be left alone. I never wrote or shared the thoughts behind a piece until I was asked to do so recently. Many sleepless nights, when getting up and painting relieves the stress and allows the movement of strokes to take over. The recognizable hub of the family is still intact, in this the ocher orb is the one family and passages are laid out as routes to the situation, yet a piece of rose wood lies vertically not allowing some information to get through. Only hope. Belief and time to escape with my paint and thoughts aides in a clearer mind. I am so very blessed. This is a pleasant size piece a 24" x 24" x 1 1/2" deep. or my blog nancybossert.blogspot.com My art blog can be accessed through my menu on artspan. 5" x 5"7" x 7"9" x 9"11" x 11"13" x 13"16" x 16"
"Ocean Bridge" was painted following "Island Highway", and again, the experience was good. From start to finish, this was pure joy. The movement totally occupied my mind, but I always become so absorbed as I paint, however, these felt a bit different. "Ocean Bridge" has more small areas than "Island Highway" but they are important to my thoughts and composition. The final before glazing was the pencil work, and my love for linear. The linear is not as dominate in "Ocean Bridge" as in "Island Highway" but it completes this fine art piece. This is on the wider stretched canvas 1 1/2", so it can be hung with out a frame, but if a frame is desired this canvas becomes a great candidate for the floater style frame. Check out my blog link on artspan to view works in progress. Also, check out the wonderful framing option Artspan provides for print options. No cost to play, whether you want some framing ideas for how the original might look, or you would like to purchase a print. This category is a fantastic aid. Allow yourself to escape to feel the waves. Ending the year with a new Abstract oil, "Doors", opening many new Doors to the New Year! Happy New Year everyone!! To a Super 2018!!! This is an abstract oil painting on a stretch canvas, 24" x 24" x 1 1/2". I hope you feel the doors opening and available within the time ahead of you. This is done with a palette knife and there is a collage base. The painting is carried onto the sides of the stretched canvas, so there is no need for framing. However, if a frame is desired, I would suggest a floater frame. Enjoy all the tactile and visual texture of "Doors". Update, I am currently framing "Doors" with a strip framing. This is a piece, as is "On the Outside", "Counting Sheep", "Separation Move", "Black Roof" which have significant story lines. Not that my others don't, I always paint with a personal narrative. Hope these can touch you also. This will be ready for shipping in a couple weeks or will go for exhibition. Island Highway, just feels so good. From start to finish, this was pure joy. The movement totally occupied my mind, but I always become so absorbed as I paint, however, this felt a bit different. The small areas were perfectly important. The final before glazing was the pencil work, and my love for linear. Just completed this fine art piece. This is on the narrower stretched canvas 3/4", so it can be hung with out a frame, but if a frame is desired this canvas becomes the easiest to frame with many choices. I still enjoy the floater frames and they accommodate this size profile. You can even frame with a frame in which the canvas is overlapped by the frame and the frame fits into the frames rabbet. Allow yourself to escape to the Island. "Red River" is all about the emotional content of land. To the viewer it may just be an interesting abstraction with movement. 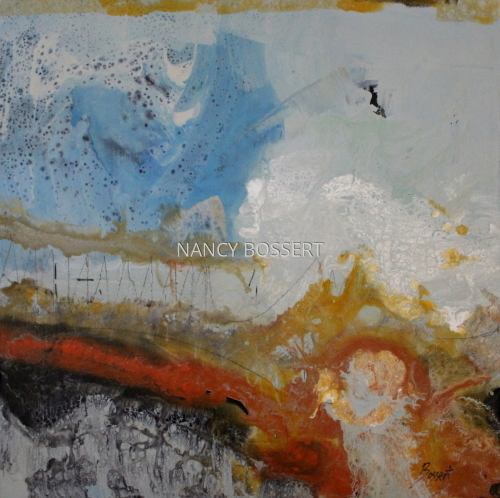 It is part of the series which include "Island Highway", "Ocean Bridge" , "Falling", "Below Clouds" and a number of smaller abstractions. To me, it gives me time to reflect and paint attachment to land. Something I tend to do with my favorite figurative pieces is work from a birds eye view or odd angles. Here I am also minimizing the land/water masses but using a straight forward view. The two canvases each measure 24" x 24" x 5/8". 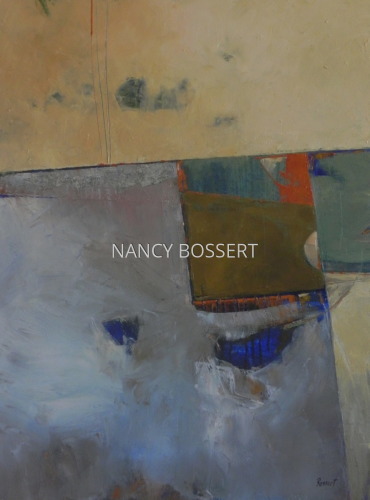 Combining these two canvases for a horizontal presentation they measure 24" high x 48" x approximately 5/8" deep. I am planning on framing this piece, but haven't decided for sure. The price set is for the paintings alone. It will change and photos will be shown if framing occurs. Saatchi likes that the dyptich pieces are shipped the hanging size, but with the narrow canvas that adds an undo expense to the client. I have a professional packer and would rather these be shipped together as 24" squares. So note the sizing in my description, or ask for any changes. 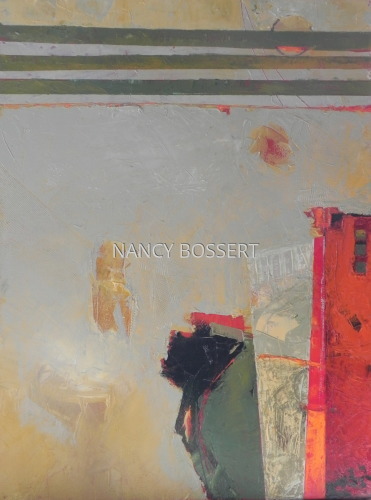 "Through Fences " is an acrylic painting / mixed media on a deeper stretched canvas measuring 24" x 24" x 1 1/2". 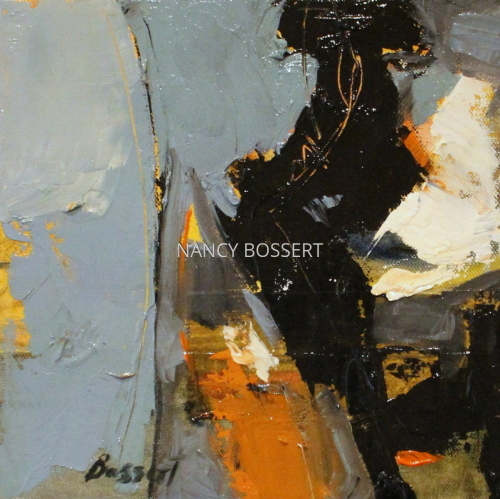 This is a low keyed abstraction with hues dominating in light blue, ocher, gray, touches of black and more. 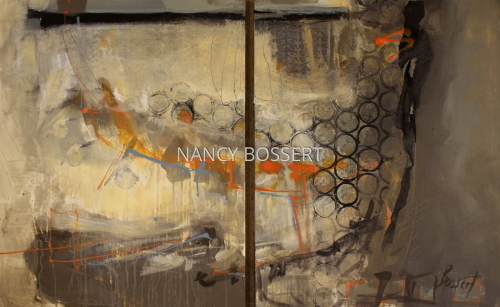 "Through Fences" uses a collage technique on triple primed canvas and utilizes a mix of material and fibers with the application of acrylic paint and touches of gold leaf. When I step back to view this painting , what comes first to mind is the intricacy of simplicity. While hues don't scream, there is much for your eye to glide across and rest. The love of tactile and visual texture are present. A few subtle diagonals work with the color composition. This is a square format and is not framed, nor does it need framing. If a frame is desired, use a floater frame. Sides of this canvas are painted. Black Roof, is an oil painting on stretched canvas measuring 10" x 10" x 1. 5". This is not framed, but could be framed in a floater style frame. This a reflection in abstract of the property we just sold and left. It is an emotion statement of privacy lost with vastness surrounding. Pond, quiet land and now we journey into the new. This oil is created with a palette knife with a limited color palette. The textures and color blocking hold the love. The sides of the canvas carry the paint coloration. Enjoy. This is wired for immediate hanging without a frame. If print options are available, play with the options. 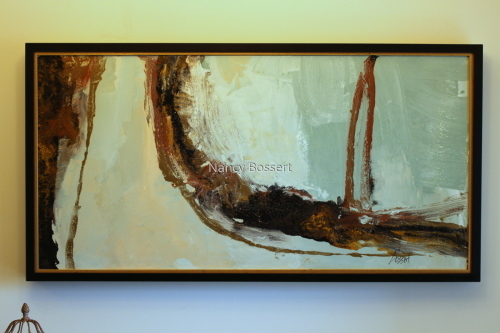 It costs nothing to see how this piece looks in different sizes and on different colored walls. Just enjoy And check out my blog on this site.
" Blue Smoke" is an abstract acrylic and silicone medium work. It does have some tactile texture, more like a snake skin, but very smooth, gloss finish. I never stop exploring and always want to learn something new everyday. " Blue Smoke " is beautiful, in it's flow of blues, yellow/cream,orange, black, khaki and so much more. This is on a 14" x 14" x 1" wood canvas, so I am painting on triple primed wood. This can be framed, no mat, but use a floater frame or a frame that will accommodate a 1" side. I write about framing unframed pieces on my blog. I have a piece that works with this one as a mate, but they can be purchased separately, "Capturing Blue". "Capturing Blue" is an abstract acrylic and silicone medium work. It does have some tactile texture, more like a snake skin, but very smooth, gloss finish. I never stop exploring and always want to learn something new everyday. 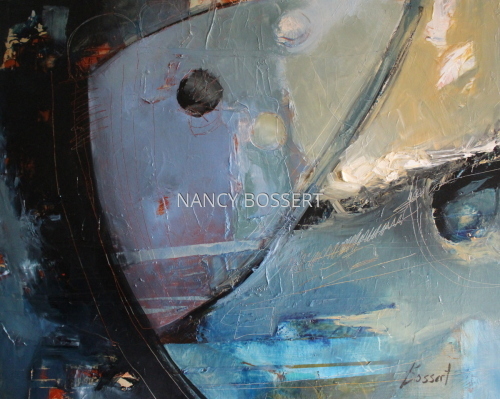 "Capturing Blue" is beautiful, in it's flow of blues, yellow/cream,orange, black, khaki and so much more. I have a piece that works with this one as a mate, but they can be purchased separately, "Blue Smoke". 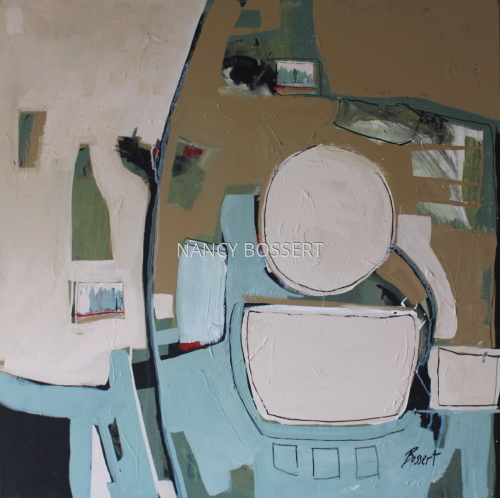 "Tuscany" is an acrylic painting on triple primed stretched canvas that measures 36" x 36" x 1.5" and is wired and ready to hang. 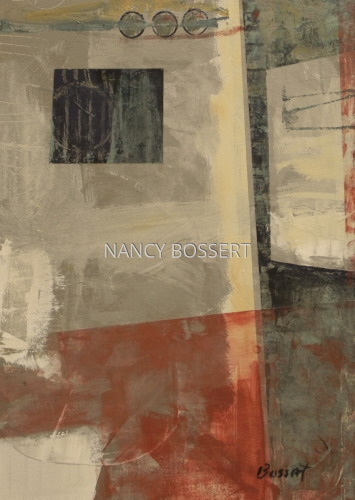 "Tuscany" incorporates a collage composition base on the triple primed canvas, using a variety of papers and textures through the selection of papers and modeling paste. The coloration is beige, tan/brown, green,blue, touches of red, black, plus variations. The sides of the canvas are painted, so a frame is not necessary to hang this fine art painting. If a frame is desired, I might suggest a floater frame, so that the frame does not lip over the edge of the piece. As always, I show a passion of mass and line. Blocking off areas of my composition and working within a color palette that will produce a mood, and a well balanced piece. "Tuscany" to me feels soft and free; with beautiful land masses and then tighter groupings or populations. Whether I am painting a non objective abstraction or including the human figure/still life, linear components are important to me, as well as a balance of form and shape. "Tuscany Veil" is an abstract acrylic painting on stretched canvas. This painting is framed in a black wood frame that lips over the painting surface. The actual painting is 30" X 40". Similar in tonality to "Tuscany". This is a horizontal painting that is framed and wired and ready to hang. The feel is the vastness of the land in Tuscany punctuated by villas. A sweet smelling piece, but still is loaded with an exciting tactile surface. The surface is not overdone, but provides a network to the geography. Also enjoy playing with the print options that are available. It is a fun aspect that can even show how a piece might look framed and/or in a different size. 5" x 6.75"8" x 10.5"11" x 14.5"14" x 18.5"17" x 22.5"19.75" x 26.25"
"Ocean", is an acrylic painting on 100% archival, acid free, cotton rag paper. The paper measures approximately 30 1/2" x 22". These latest abstractions are dealing with shape and form breaking down the surface plane. The same is what I use as I work with the human figure. There is more tension in "Blue Island" than in "Eclipse". Where as, "Ocean" is an abstraction that brings back memories of the ocean. Looking through the water, and having a shell or rock distort the color, and the white froth mix with the slight obstructions. In "Ocean" the coloration is soothing in blue/green hues with underlying tones on ocher mix and bright blue blend in a smaller area. A feel of flesh pops through, maybe my foot underneath. There are also linear expressions marking "Ocean" that it is living, breathing and in constant flux. 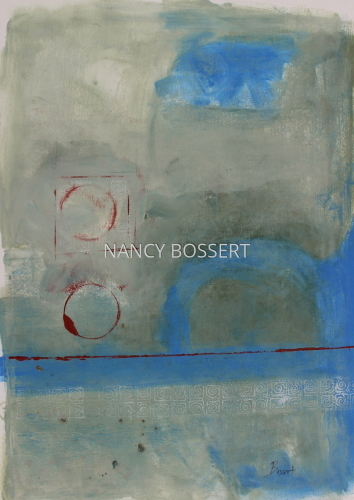 This painting is not framed, leaving many options open to the collector and decor'. The image I have shown measures approximately 29" x 20". This is the approximately area I would suggest revealing through the opening in a mat or frame. However "Ocean" could be cropped and matted/framed up to the white. ( I have included the full paper view also). This is acrylic painting, and gesso. Lots of visual and tactile texture. 7" x 5"10" x 7"12.75" x 9"15.75" x 11"18.5" x 13"24.25" x 17"
Inspired by the idiom "Canary in the Coal Mine", this acrylic painting is a 2 panel, deep stretched canvas, with each panel measuring 30" x 24" x 1.5". The actual painting will measure 30" x 48" x 1/5" when hung on the wall. I begin with a triple primed canvas and I have added papers and gesso to collage my surface and create my base composition. There are four canary images in flight and the title wording in the piece,but much of that has been obscured. These two panels are wired and ready to hang. My preference is that they hang with a slight separation between the two as shown in the photograph, adding an additional 1" to the overall presentation view on the wall (30" x 49" x 1.5" or slightly wider). 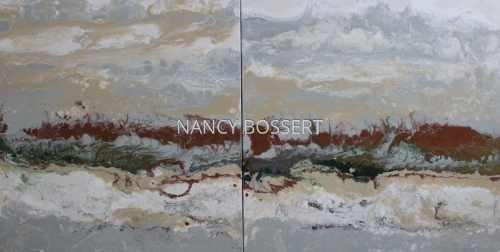 These panels do not have to be framed since the painting carries onto the sides of the canvas. However a floater or edge frame could be used if desired. "Red Umbrella" is an acrylic painting on triple primed stretched canvas that measures 36" x 36" x 1.5" and is wired and ready to hang. "Red Umbrella" incorporates a collage composition base on the triple primed canvas, using a variety of papers and textures. The color theme is re, black and a soft ocher, plus variations. The sides of the canvas are painted, so a frame is not necessary to hang this fine art painting. If a frame is desired, I might suggest a floater frame, so that the frame does not lip over the edge of the piece. I added a curved line element of raised molded half spheres, measuring approximately 3/8" in diameter and an 1/8" high. "Canyon Eyes" is an acrylic painting on triple primed stretched canvas that measures 36" x 36" x 1.5" and is wired and ready to hang. "Canyon Eyes" incorporates a collage composition base on the triple primed canvas, using a variety of papers and textures. The color theme is raw umber/khaki,black, gold, teal, cream,deep red, plus variations. The sides of the canvas are painted, so a frame is not necessary to hang this fine art painting. If a frame is desired, I might suggest a floater frame, so that the frame does not lip over the edge of the piece. Repetition is important within the composition. Look closely at what appears to be black circles, they have visual texture, plus the gold linear element. "Eclipse" is an acrylic painting on triple primed stretched canvas that measures 36" x 36" x 1.5" and is wired and ready to hang. 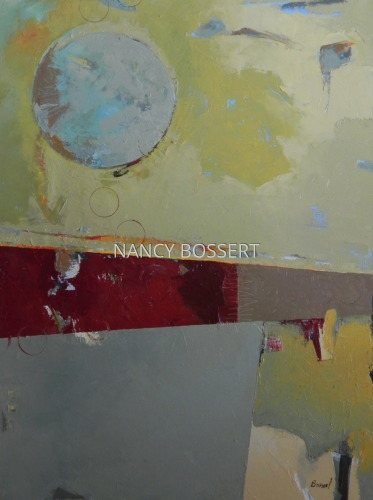 "Eclipse" incorporates a collage composition base on the triple primed canvas, using a variety of papers and textures. The color theme is tonal/muted with a visual/textural area filled with earth tones, this is balanced by my choice of a soft blue slightly enhanced with yellow to the blue. The sides of the canvas are painted, so a frame is not necessary to hang this fine art painting. If a frame is desired, I might suggest a floater frame, so that the frame does not lip over the edge of the piece. Whether I am painting an abstraction or including the human figure or still life, linear components are important to me, as well as a balance of form and shape. 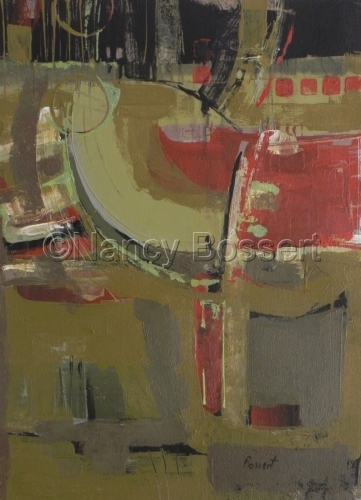 "Red Arch" is an abstract oil painting on stretched canvas. The canvas measures 30" x 24" x 7/8". This is not one of the really wide canvases, but I like this profile if I want to do a standard frame and cover the depth of the canvas. The painting is carried onto the sides. This painting is now framed in a black floater wood frame. Coloration is red rust, blue, yellow ocher, orange, black and more. 10" x 8"13.75" x 11"17.5" x 14"20" x 16"
"Eclipse", is an acrylic painting on 100% archival, acid free, cotton rag paper. The paper measures approximately 30" x 22 1/2". These latest abstraction are dealing with shape and form breaking down the surface plane. The same is what I use as I work with the human figure. In "Eclipse" the coloration is soothing in cool hues with a touch of rich rust breaking through and might be suggesting the horizon. This painting is available but has been framed for exhibition. The pricing does not include mat and frame; leaving many options open to the collector and decor'. The image I have shown through the opening in the mat measures 27.5" x 20.5". 7" x 5"10" x 7"12.75" x 9"15.5" x 11"18.25" x 13"23.25" x 16.5"
"Blue Street" is an abstract acrylic painting on a triple primed stretched canvas. This painting measures 5' x 4' x 1 3/8" deep. This painting is not framed, but is on a stretcher and the painting is carried onto the sides. This Fine Art piece is also wired and ready to be hung vertically. Also know for my realistic figurative paintings and drawings I find it important to explore the abstract. 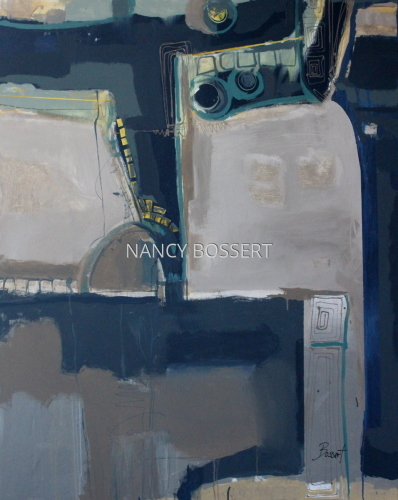 I find the work such as Richard Diebenkorn, and Hans Hofmann to have strong influence on my abstract view. My admiration centers on their unique ability to fracture space. , and find composition excitement in the movement of shapes, forms, color, value and texture. By working both abstract and realistic a better understanding is achieved in the comfort of viewing, and emotional movement. My color palette is cool, with slight touches of yellow. I used a blue family of coloration and taupe fields that vary in strength. 6.25" x 5"10" x 8"13.75" x 11"17.5" x 14"21.25" x 17"25" x 20"
"Change Our Minds", is an abstract oil painting on a triple primed stretched canvas that measures 30" x 24". This is a deep canvas that is framed with a solid wood floater frame. The color dominates in rust, brown, cream, tonal light khaki, gray, black and many more variations. The frame is a warm silver, with a front profile of 1 1/2" and projects from the wall 2". The overall size of "Change Our Minds" measures approximately 33 1/2" x 27 1/2". 6.25" x 5"8.75" x 7"11.25" x 9"14" x 11"16.5" x 13"
"Forbidden Street" is an acrylic abstract on a square stretched canvas. The canvas measures 24" x 24" x 1 1/2" deep. The painting is carried over onto the sides. This painting includes a wood frame, gorgeous, 1 1/2" front profile with a 2" projection from the wall, bronze coloration. Overall size and ready to hang 27 1/2" x 27 1/2". Not wanting to go into a lot of reasoning for the piece, but that we set so many boundaries, whether physical or emotional. Hope you can enjoy the beauty in the piece as it fractures the space and as you get close you see the wonderful texture that lies underneath the paint. 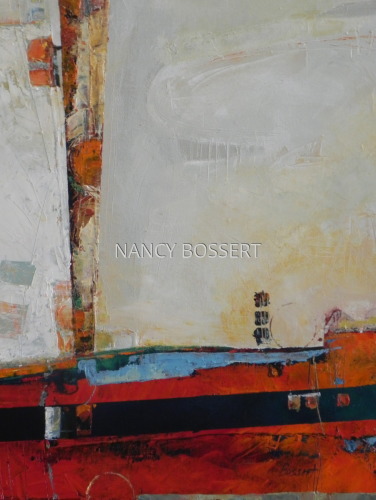 "Never Distant", Is an abstract acrylic painting on triple primed canvas. The wood stretchers are deep measuring 1 1/2" and the painting is carried onto the sides of the canvas stretcher. By carrying the painting over and using the deeper canvas there is no need to frame this painting. However, you may choose to frame in a floater frame for your decor'. 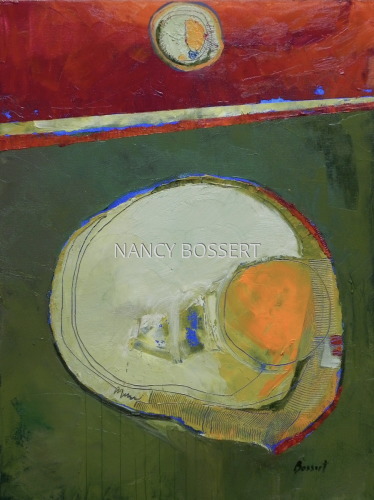 This painting does incorporate some collage on the base gesso layers prior to the acrylic painting. I establish my palette and directional composition with the collage, and allow the collage to punctuate through the paint. I am in the process of moving and this painting captures my preoccupation with the land and it's disrupted beauty. I enjoy all the hues that are quietly assembled, and to someone else will be missed entirely. Enjoy this 40" x 30" painting that your eye can flow over easily but can stop and rest on soil changes, stone illusions, and much more. 6.75" x 5"10.75" x 8"14.75" x 11"18.75" x 14"22.5" x 17"28.5" x 21.5"
"Muted Torch" is an abstract, acrylic painting on 300 pound, archival,acid free watercolor paper. The paper measures vertically 30" x 22 1/2"
The image that should be exposed through the opening in a mat (as shown) should measure approximately 27" x 20". I would suggest matting with a clean white or off white archival mat. I would love to see at least 6" of mat, and then your frame. This piece does require glass. The coloration is low key or muted in greens, ocher, tan, gray, salmon hue and more. Materials: archival paper, acrylic paint, and gesso. Mat and frame is not included, but this allows the collector a wide range of possibilities. 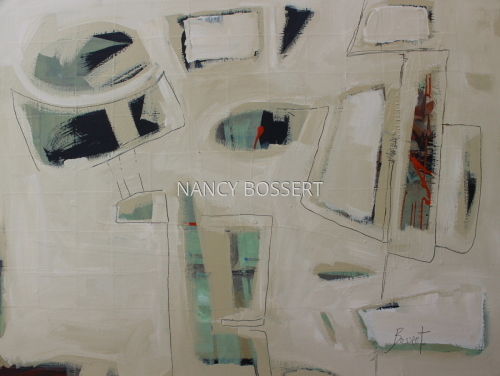 7" x 5"11" x 8"15.25" x 11"19.5" x 14"23.5" x 17"
"Raven Road", Is an abstract acrylic painting on triple primed canvas. The wood stretchers are deep measuring 1 1/2" and the painting is carried onto the sides of the canvas stretcher. By carrying the painting over and using the deeper canvas there is no need to frame this painting. However, you may choose to frame in a floater frame for your decor'. I am in the process of moving and this painting captures my preoccupation with the land and it's disrupted beauty. I enjoy all the hues that are quietly assembled, and to someone else will be missed entirely. I love the road that takes you to my new place with it's very special meaning, which I might reveal at another time. For now, enjoy the dark to light and the sweeping movement that is created midway. Colors that punctuate the dark and light are blue/teal and red/orange/rust. 6.75" x 5"10.75" x 8"14.75" x 11"18.75" x 14"22.75" x 17"26.5" x 19.75"
"Sands of the Soul" is an abstract oil painting on a stretched canvas. This is currently available, but will be going out for exhibition during the Month of May if it hasn't been purchased prior. This is an original abstract oil painting on a deep canvas, depth of 1 7/8". That will be the projection from the wall. The sides of this painting have been painted so framing is not necessary. Size is 30" x 24" and the coloration is a cream, khaki green, robin egg blue, orange and black, all with variations. Enjoy the balance of the composition. I added a detail in the photos. 10" x 8"14" x 11"17.5" x 14"21.5" x 17"27" x 21.5"
Actually my love of combining testures has a huge impact. The love of Klimt's work and patterns can be viewed within the upper third area, but my handling is looser or suggested. The pattering might also resemble mosaic application with grout. 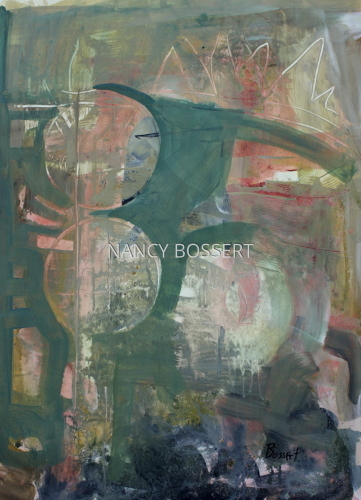 Much is my life is captured in my abstracts, a subtle push/pull in the arrangement of shape/form and texture. In "Orohans of Night" the tension at the top releases to the diagonal that runs the remaining 2/3 of the canvas. As the Orphan moves from the upper plne he/she will soon realize that they still cast their own shadow. The shadow reveals their existence. As far as viewers. I hope the viewer can create their own narrative, and that their eye will move over the piece easily, finding resting places along the way. That, as I do, find new areas to look at everyday. It isn't necessary to know what it means to me, but hopefully creates joy and pleasure in your setting. 6.75" x 5"10.75" x 8"14.5" x 11"18.5" x 14"22.5" x 17"26.25" x 19.75"
"Unclouded" is an abstract acrylic painting on 300 lb. archival, acid free, 100% cotton rag, primed paper. The paper measures approximately 30" x 22 1/2". I cropped in on the paper to reveal the painted mage to measure approximately 26 3/4" x 19 1/2". The outer edge of the painted image is very crisp. This painting allows so much for the collector to decide how to present. This piece can be framed right up to the edge of the painting itself, or mat larger and frame to your own decor'!! Either way the coloration will add drama to you space and work beautifully with figurative or still life works. The coloration of "Unclouded" is bright yellow, khaki brown hue, blue and touches of a deep crimson. 7" x 5"9.75" x 7"12.5" x 9"15.25" x 11"19.25" x 13.75"
"Naming the Prince" " is an abstract acrylic painting on 300 lb. archival, acid free, 100% cotton rag, primed paper. The paper measures approximately 30" x 22 1/2". I cropped in on the paper to reveal the painted mage to measure approximately 27 1/2" x 21". One of my favorite pieces, this fine art piece does require a mat and frame and should be under glass. Placing on a wall is just to help visualize the color impact. 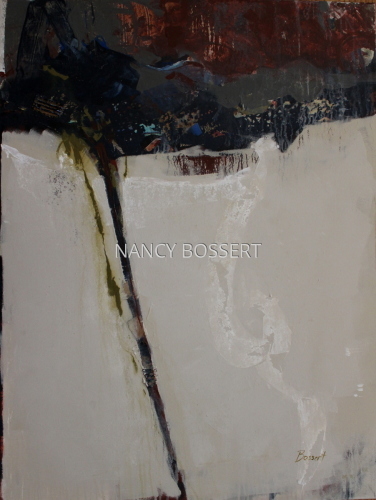 As the collector/purchaser you have many possibilities as to matting and framing to your tastes and decor'. "Teeth on the Fence" is an abstract, oil painting on triple primed stretched canvas. 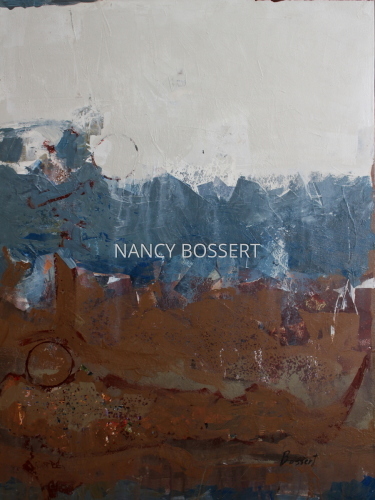 This is a non-objective abstract painting. This painting measures 16" x 12" and is 1 1/2" deep. The coloration dominates in a theme of blue, red, off white and more. This is ready to hang in a wood floater frame with the outside dimension measuring approximately 18" x 14". The frame front is a warm silver with a front profile of 5/8" and is 2" deep with black sides. 6.75" x 5"9.25" x 7"12" x 9"14.75" x 11"17.25" x 13"18" x 13.5"
"One Foot in Paradise" is an abstract oil painting on triple primed stretched canvas. This fine art painting measure 40" x 30". The painting carries onto the sides of the deep canvas stretcher that measures 1 1/2" deep. Everyone views their own space of Paradise differently. Could be family closeness, home and land, spiritual, large and small (just our basic necessities). I find my needs are small, and my family and friends and spiritual are great. From day to day or year to year, these spaces as needs change. There have been days when I feel like an island, but rare. 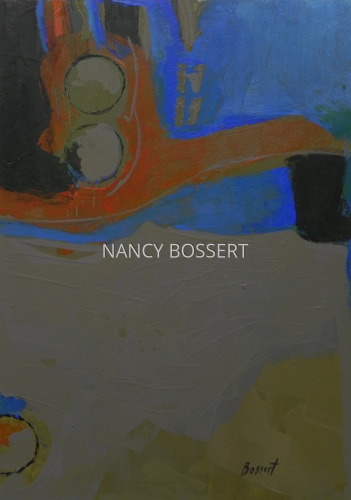 So in "One Foot in Paradise" I can view shifts and very restful peace in the breaking down of my life, expectations, time periods and dreams through the particular areas created and how they touch one another. Enjoy viewing, name your own paradise. Colorations are a variety of yellow hues, grays, greens, blue, ocher, and much more. 6.75" x 5"9.5" x 7"12.25" x 9"15" x 11"17.5" x 13"
"Tied by Strength" is an abstract acrylic painting on a stretched canvas measuring 12" x 12" x 1 1/2". I am very married to the coloration in this painting, low keyed, but has an underlying flavor. No frame is necessary with the wider canvas format, but can be framed if desired. 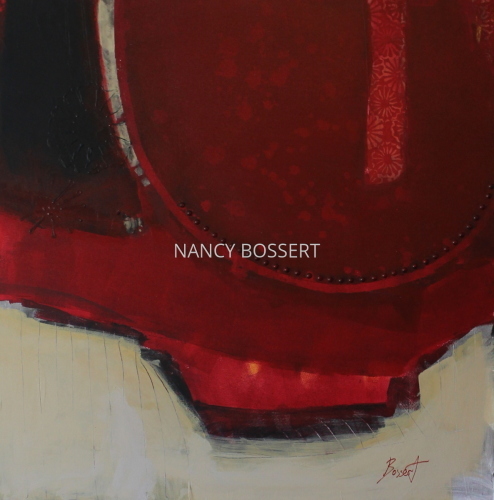 "Red Pool" is an abstract oil painting. This painting does not require a frame because of the depth of the canvas and that the painting is carried onto the side. The painting measures 14" x 11" x 1 1/2". 6.5" x 5"10.5" x 8"14.25" x 11"18.25" x 14"22.25" x 17"
"Whisper Wall" is an abstract, oil painting on triple primed stretched canvas. 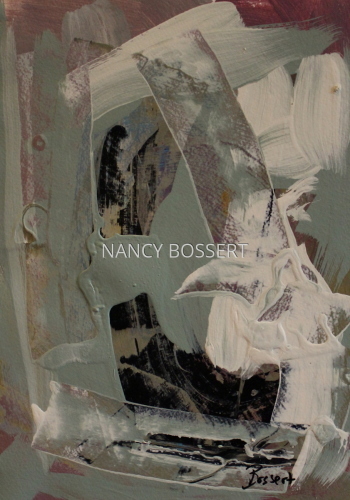 This is a non-objective abstract painting. This painting measures 16" x 12" and is 1 1/2" deep. The coloration dominates in a theme of cream, red/orange, green, brown and more. 6.5" x 5"9.25" x 7"12" x 9"14.5" x 11"19" x 14.25"
"Apartment" is an abstract, oil painting on a stretched canvas that measures 24" x 18" x 1 1/2" deep. This painting is framed with a wood floater frame. The surface is impasto, and the majority of "Apartment" is created with a palette knife. I also added a complimenting pieces " Mother May I" and/or "Centered Direction". "Apartment" is framed is a beautiful wood floater frame with black sides and a silver textured front profile. Ready to hang. 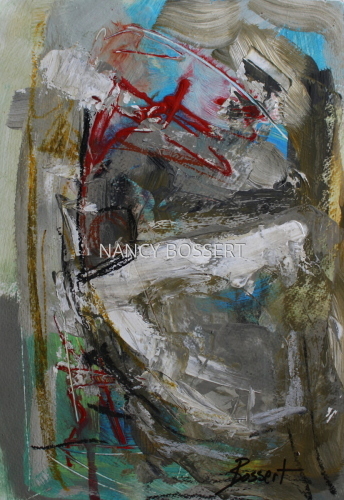 "Behind His Wing" is an abstract, oil painting on triple primed stretched canvas. This is a non-objective abstract painting. This painting measures 16" x 12" and is 1 1/2" deep. The coloration dominates in a theme of blue, soft yellow, coffee black, touches of orange and more. 6.75" x 5"9.5" x 7"10.75" x 8"12.25" x 9"14" x 10.5"
"Mother May I" is an abstract, oil painting on a stretched canvas that measures 24" x 18" x 1 1/2" deep. This painting is framed with a wood floater frame. Mother May I" is definitely abstraction, but there is communication happening with the forms the line and the the title really helps to tell you the story. Mother being the larger sphere like shape and the smaller representative of our children. And a very simple example is crossing the line or street "Mother May I" but larger, are parenting never ends as our love for our children , friends, those we have yet to meet. Lending that hand or giving the promise that it is "Okay". I hope I have said enough. Enjoy and much love to all. The surface is impasto, and the majority of "Mother May I" is created with a palette knife. I also added a complimenting piece " Centered Direction". I will post a picture of them framed asap. 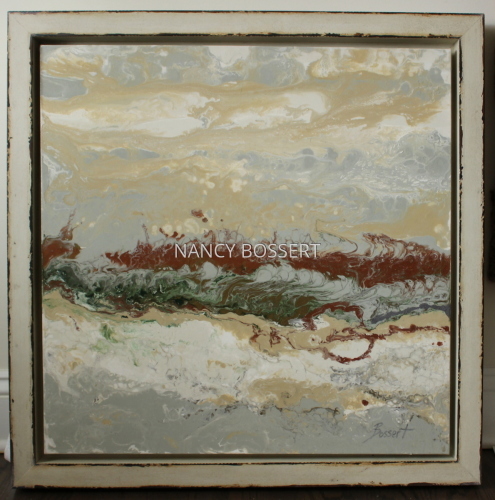 This painting is framed in a beautiful wood floater frame, black sides and a silver front. Wired ready to hang. 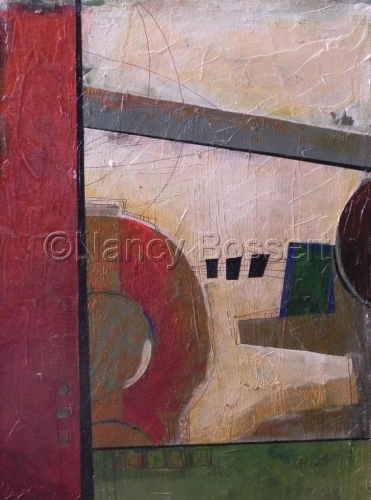 "Windows" is an abstract acrylic painting on 140 lb. archival, acid free, 100% cotton rag, primed paper. The paper measures approximately 30" x 22 1/2". I copped in on the paper to reveal the painted mage to measure approximately 25 3/4" x 18 1/4". The outer edge of the painted image is very crisp, but there is a soft muted cool gray wash that extends beyond the perimeter. The coloration is low keyed: taupe, orange/rust, blue values and dark green/black. 7" x 5"10" x 7"12.75" x 9"15.75" x 11"22.75" x 16"
"Rising" is an abstract, oil painting on a stretched canvas that measures 24" x 18" x 1 1/2" deep. This painting is framed with a wood floater frame. 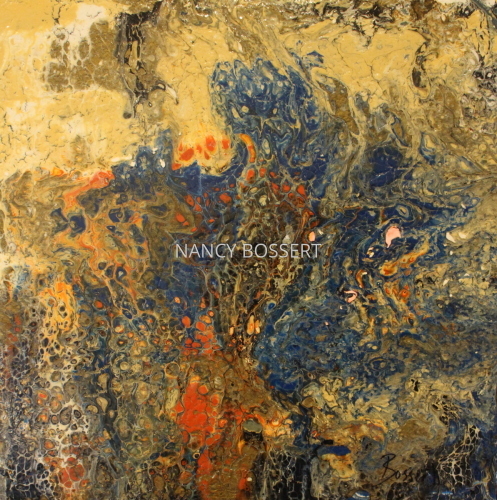 The surface is impasto, and the majority of "Rising" is created with a palette knife. I also added a complimenting piece " Casting". So you can view the two together. The oil painting is now framed in a beautiful wood floater frame. Black on the sides and a subtle silver on the front! 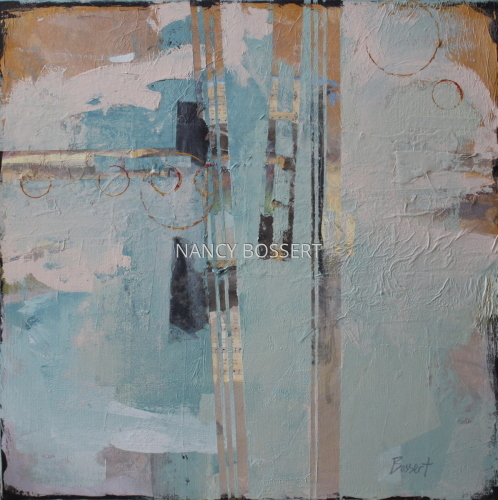 Beautiful as it works with "Rising" and is ready to hang and enjoy! The space between the frame and the painting edge is approximately 1/4". 6.75" x 5"10.5" x 8"14.5" x 11"18.5" x 14"22.5" x 17"24" x 18"
"Native Straight" is an abstract acrylic on a double primed stretched canvas that measures 24" x 24". I am so excited about the movement and coloration. Enjoy, the range of rust/ sienna hues mingled with slate green/gray and teal. This painting is framed with a wonderful warm silver angled profile frame with an underlying red tone. The frame measures 3/4" front profile with a projection from the wall of 1 3/4". The overall size of "Native Straight" is 25" x 25". 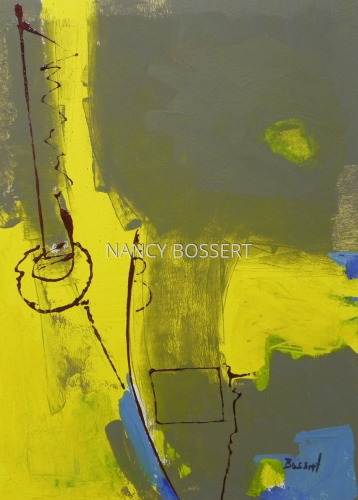 "Where I Stand" is an abstract oil painting on triple primed stretched canvas. This fine art painting measure 48" x 36". The painting carries onto the sides of the deep canvas stretcher that measures 1 1/2" deep. Colorations are a variety of yellow hues, grays, red, brown and much more. 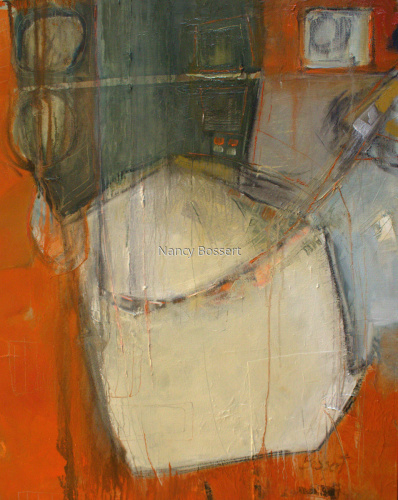 One of the images attached shows a glimpse of my studio with a figurative piece I am working on. 6.75" x 5"12" x 9"14.75" x 11"17.5" x 13"
"Generational Frequency" is an abstract acrylic painting on 300 pound water primed watercolor paper. The paper is acid free, 100% cotton rag.This piece is not matted and framed. but I have shown you how it might look framed and with a mat and included the suggested dimensions. "Generational Frequency" coloration is a khaki, cream, rust, black, slate blue and more. Not included but pictured as a framing idea:The mat is a cream linen and measures 5" top and sides with a 5 1/2" bottom measurement. The image exposed through the opening in the mat measures approximately 20" x 27". The frame is a wide wood distressed warm silver with gold tones; the front profile of 2 1/2" and projects from the wall 1 1/2". The overall size of this suggested matting and framing "Generational Frequency" measures approximately 35" x 41 1/2". There are always so many possibilities for framing a fine art piece. 5" x 6.75"7" x 9.25"9" x 12"11" x 14.75"13" x 17.25"15.75" x 21"
"Canes" is an abstract acrylic painting on 300 lb. archival, acid free, 100% cotton rag, primed paper. The paper measures approximately 30" x 22 1/2". I copped in on the paper to reveal the painted mage to measure approximately 26" x 18 1/4". The outer edge of the painted image is very crisp, but there is a soft muted cool gray wash that extends beyond the perimeter. The coloration is low keyed: taupe, red/rust, green values, yellow, touches of white and dark green/black. 7" x 5"9.75" x 7"12.75" x 9"15.5" x 11"18.25" x 13"
"Canary Curve" is an abstract acrylic painting on 300 lb. archival, acid free, 100% cotton rag, primed paper. The paper measures approximately 30" x 22 1/2". I copped in on the paper to reveal the painted mage to measure approximately 26 3/4" x 19 1/2". The outer edge of the painted image is very crisp, but there is a soft muted tonal yellow wash that extends beyond the perimeter. The coloration is mainly with in the rust and khaki green, browned/green family, blacks and touches of light seafoam green as accents. 7" x 5"9.75" x 7"12.5" x 9"15.25" x 11"18" x 13"
"Strings" is an abstract acrylic painting on 140 pound primed watercolor paper. The paper is acid free, 100% cotton rag. "Strings" coloration is a khaki, cream, ocher, green, rust, black, slate blue and more. This piece is priced unframed and without a mat. The mat and frame example shows one possibility is framing: light cream and measures 4 1/4" top and sides with a 5 3/4" bottom measurement. The image exposed through the opening in the mat measures approximately 17 1/2" x 13". The frame is a wide curved wood, antique silver with black random distress enhancements; the front profile of 2 3/4" and projects from the wall 1 1/2". This example measures with an overall size of 33.5" x 26". Framing example has been attached, but this piece does not include the frame. Lots of visual and tactile texture in "Strings". Plus my love for adding shapes and linear to complete my compositions. 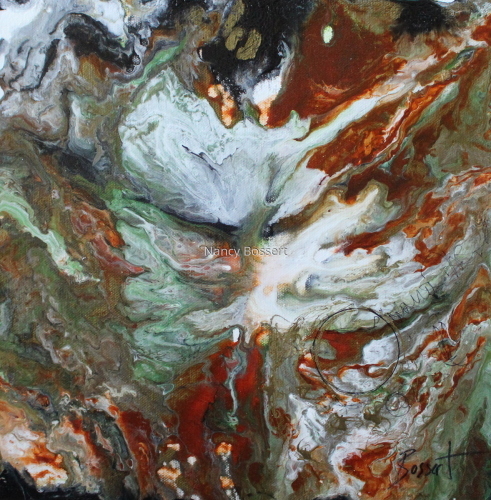 Granite Seize, is a abstract acrylic painting on triple primed canvas. 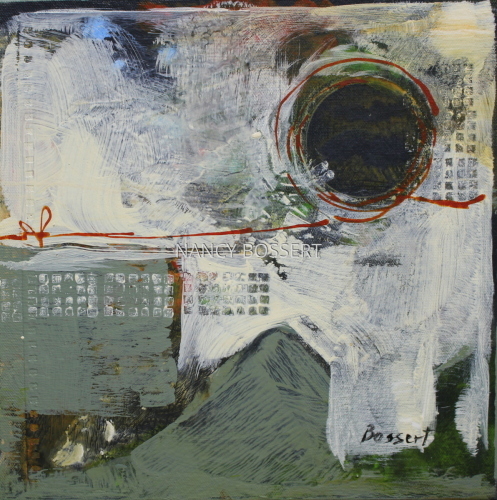 The canvas measures 20" x 20" square and projects 1.5". The painting is carried onto the sides of the canvas so framing is not necessary. If a fame is desired, I would recommend a floater frame. The coloration is a range of grays punctuated with variations, and touched for blood red cherry hue and black. 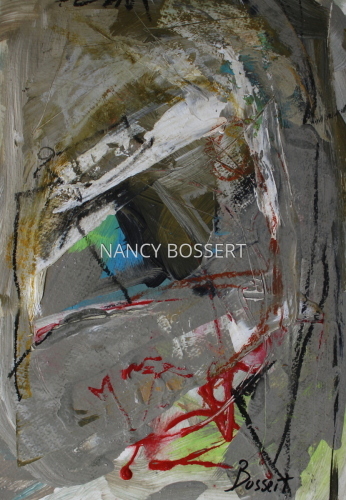 The painting has visual as well as tactile texture. Get lost in the space. 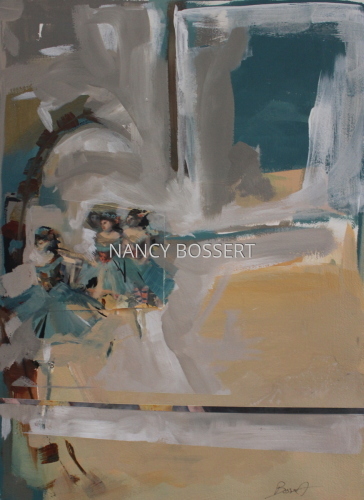 "Ballet Mind II" is an acrylic painting on 100% archival paper that measures 30" x 22.5". 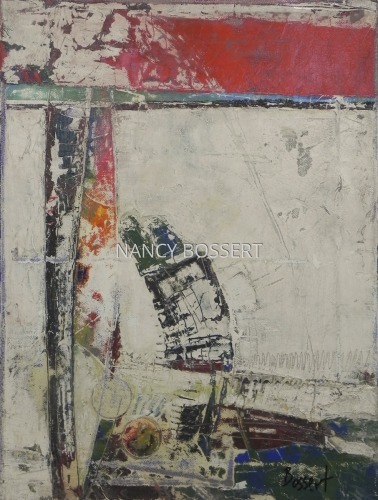 This is similar to my "Ballet Mind" created earlier and sold. 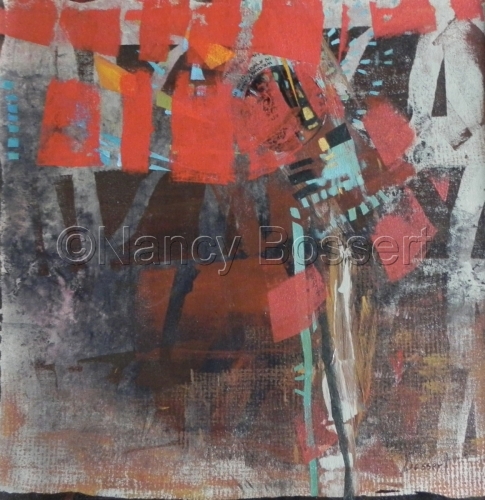 This is an abstract with collage elements with a focus and using a cut from "The Dancer and the Bouquet" by Degas. Mainly two of the dancers are actually from an archival print of this famous work. I added more pigment to the dancers and created a looser dancer on the left. She was in the original grouping, I just worked her more. 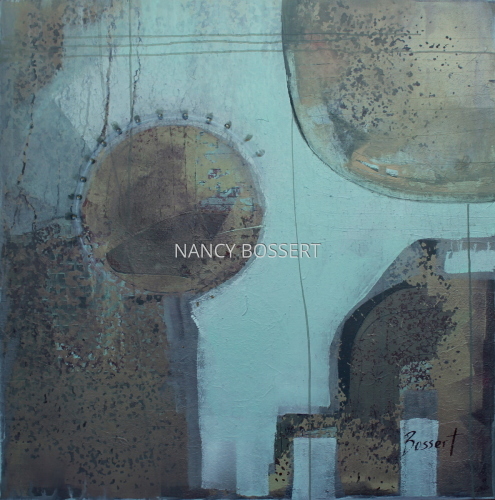 I wanted to create an abstract dance studio with an emphasis on the teal, gray and cream color family. Homage to the master, Degas. Also to reflect the abstract space and the solitary existence of dancers practice in a large space, a void to be filled by their movement. 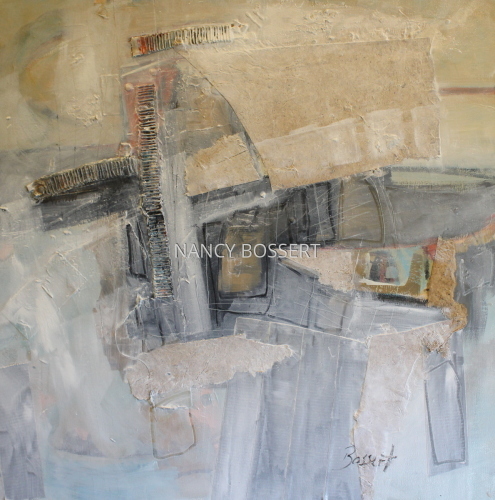 This is a mixed media acrylic painting with collage and gesso. "Below Clouds" is all about the emotional content of land. To the viewer it may just be an interesting abstraction with movement. 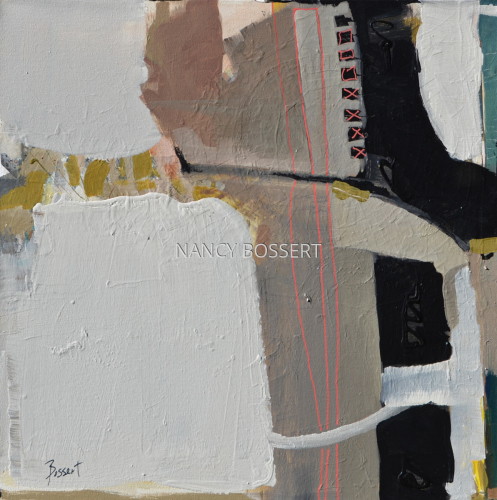 It is part of the series which include "Island Highway", "Ocean Bridge" , "Falling", Railway and a number of smaller abstractions. To me, it gives me time to reflect and paint attachment to land. Something I tend to do with my favorite figurative pieces is work from a birds eye view or odd angles. Here I am also minimizing the land/water masses but creating a different view. 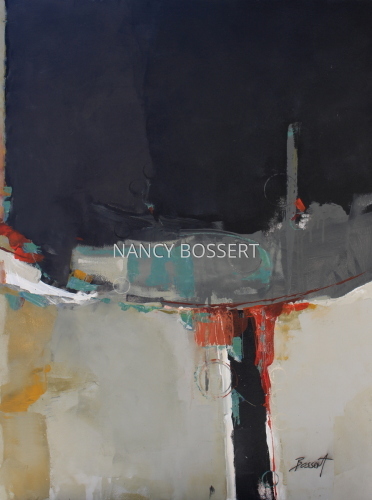 This is a horizontal canvas measuring 24" high x 48" x 1 1/2" deep. This does not need a frame and is wired for immediate hanging. If a frame is desired, I would suggest a floater frame or a deep rabbet frame style. 5" x 10"7" x 14.25"9" x 18.25"11" x 22.25"13" x 26.25"16" x 32.25"
"Below Clouds" is an abstract acrylic mixed media painting. This painting measures 24" x 48" x 1.5". This painting is wired for immediate hanging and is not framed. This can be framed if desired in a deep rabbet frame style or a floater frame. 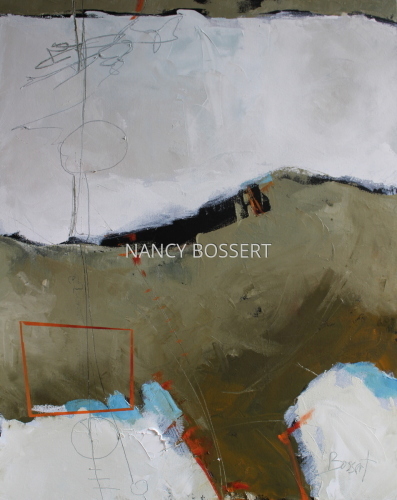 "Below Clouds" is all about the emotional content of land. To the viewer it may just be an interesting abstraction with movement. But most of my abstract deal with land and environments . 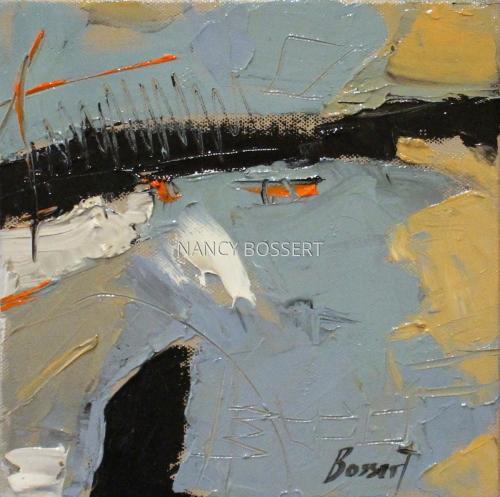 It is part of the series which include "Island Highway", "Ocean Bridge" , "Falling", Railway and a number of smaller abstractions. To me, it gives me time to reflect and paint my attachment to certain locations. Something I tend to do with my favorite figurative pieces is work from a birds eye view or odd angles. Here I am also minimizing the land/water masses but creating a different view. "Red River, left", is my response to the emotional content of land. To the viewer it may just be an interesting abstraction with movement. This is also found on my site unframed and shown as a pair. 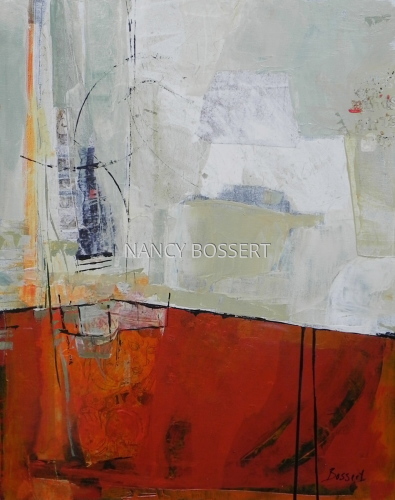 To keep things simple,this piece can be purchased with or without a frame. On this page link you can purchase the painting with the frame. Which shows the higher price for the framing and shipping costs. While this piece lasts, it can be sold without the frame, by looking at the other page link of Red River, or in limited print options. This frame is wood, cream colored with distressed inside edge and outer edge. The front profile measures 1 1/2" and the depth is 2". This is a floater frame, and is placed in the frame as square as possible. The painting is also wired. Red Rive, left, and Red river, right, each measure 24" x 24" x 5/8" unframed. 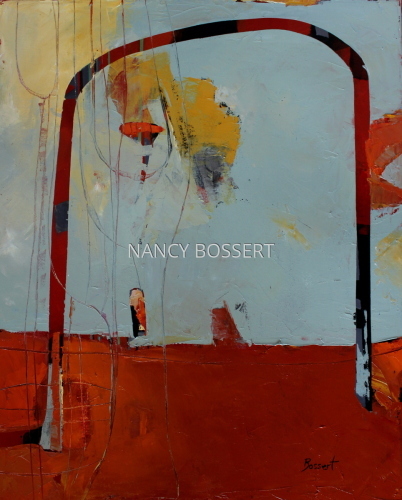 Combining these two canvases for a horizontal presentation they measure 24" high x 48" x approximately 5/8" deep. This price set is for the single painting framed. Studying some landscapes and breaking down the shapes and forms with a limited color palette. Whatever art I decide to do when I step into the studio, is just so liberating. This fine art piece is "Fish Bowls", as though you are looking from a birds eye view into two fish bowls. 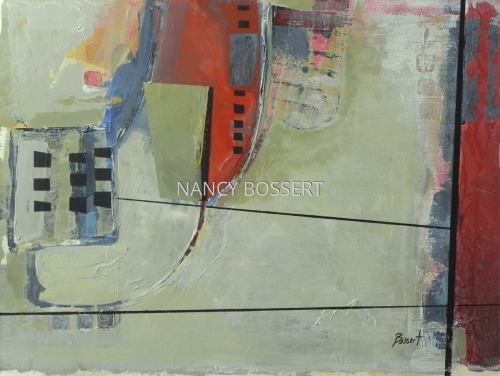 The aerial view has played great importance in my work, check out the vantage point in many of my figurative pieces. I would just slightly overlap with a mat or float in the opening of the mat. I would give this acreage with the matting, allow for a four inch mat and a bit heavier bottom mat. I left a small white edge to slip under the matting. The actual piece measures approximately 20 3/4" x 14 1/4". 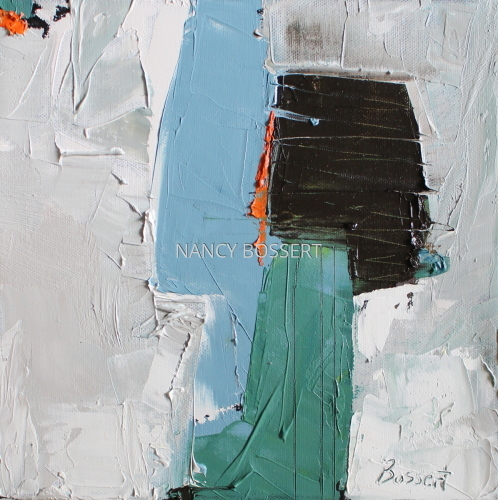 The coloration in this piece is a wonderful combination of inspiring hues: teal, orange, putty, touches of black, white and more. Two deckle edges. If the size isn't large enough, look at the print options. I never allow for more than 10 prints. But this option can give you many ideas even if your choice is to own the original. 7.25" x 5"11.75" x 8"16" x 11"20.5" x 14"24.75" x 17"26.75" x 18.25"
This fine art piece is "Lingering Crowds", as though you are looking from a birds eye view of the activity on the streets in the evening, my happy town. 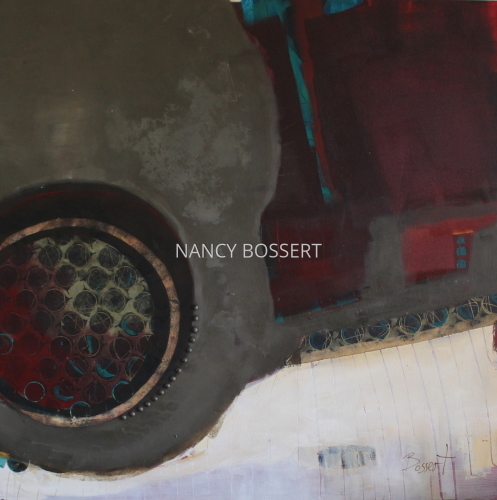 The aerial view has played great importance in my work, check out the vantage point in many of my figurative pieces. I would give this acreage with the matting, allow for a four inch mat and a bit heavier bottom mat. I left a small white edge to slip under the matting. The actual piece measures approximately 14" x 9 3/4". I have a piece that mates with this one titled " Trapped Canopy"
The coloration in this piece is a wonderful combination of earth tones popped with red: khaki/taupe, blue, green, white, touches of black, and more. One deckle edge. 7.25" x 5"11.5" x 8"16" x 11"20.25" x 14"24.75" x 17"27.25" x 18.75"
This fine art piece is "Trapped Canopy", as though you are looking from a birds eye view of the activity on the streets in the evening, my happy town. 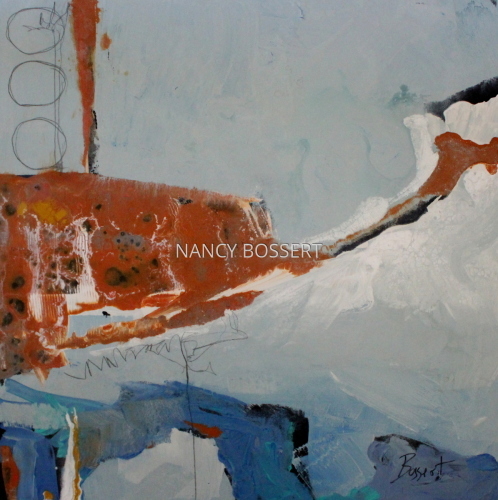 The aerial view has played great importance in my work, check out the vantage point in many of my figurative pieces. I would give this acreage with the matting, allow for a four inch mat and a bit heavier bottom mat. I left a small white edge to slip under the matting. The actual piece measures approximately 13 3/4" x 9 1/2". I have a piece that mates with this one titled "Lingering Crowd". 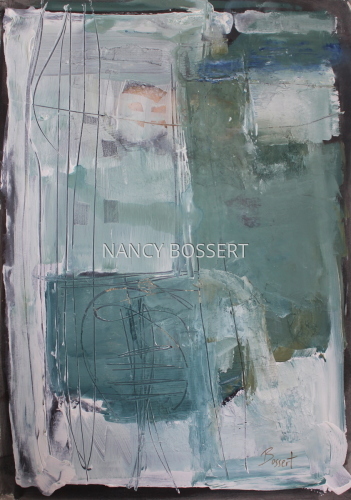 The coloration in this piece is a wonderful combination of earth tones popped with red: khaki/taupe, gray, blue, green, white, touches of black, and more. One deckle edge. 7.25" x 5"11.5" x 8"16" x 11"20.25" x 14"24.5" x 17"26.75" x 18.5"
This fine art piece is "Cave", as though you are looking from a birds eye view of the activity in into the opening of a cave through twigs and branches. 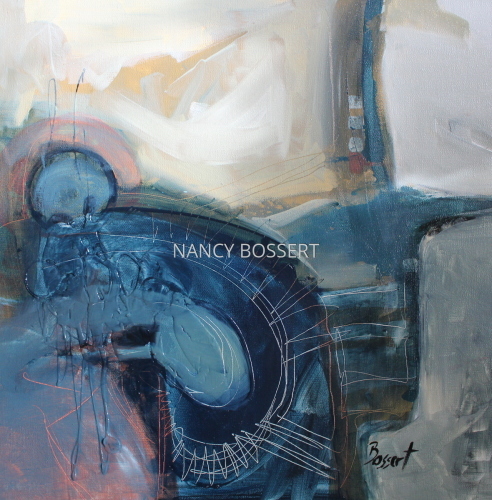 The aerial view has played great importance in my work, check out the vantage point in many of my figurative pieces. This is a great mate piece to "Caught in the wave"
I would give this acreage with the matting, allow for a four inch mat and a bit heavier bottom mat. I left a small white edge to slip under the matting. The actual piece measures approximately 13 1/2" x 9 1/2". The coloration in this piece is a wonderful combination of cool tones popped with tonal mauve, whites, black, touch of sky blue. One deckle edge. This fine art piece is "Caught in Wave". 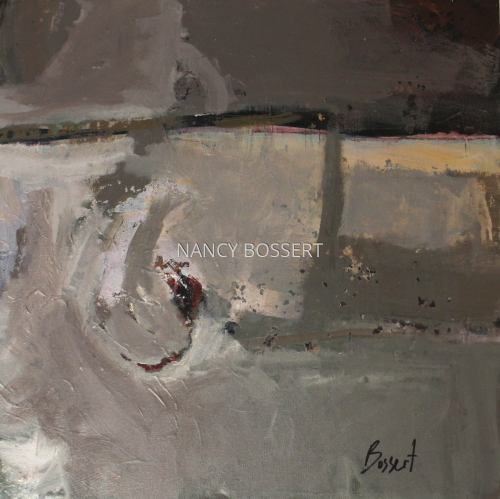 The aerial view has played great importance in my work, check out the vantage point in many of my figurative pieces. This is a great mate piece to "Cave"
7.25" x 5"10" x 7"12.75" x 9"15.75" x 11"18.5" x 13"24.25" x 17"
"White Blossom" was painted at the same time as Blue Smoke, Capturing Blue, Poppy Pour, and 7 others. This is a square painting on a deep canvas that is framed in a black wood floater frame. The painting is acrylic and oil with touches of gold and black inks. The surface is a gloss. The painting itself measures 12" x 12" x 1 1/2" deep. with the frame it measures 12 1/4" x 12 1/4" x 1 3/4" deep. The blossom becomes the birth, whether a birth of a new day, idea, challenge,mindset,It is a welcoming. Where All Roads Lead, is an oil painting painted on a mixed media surface of papers, fabric, acrylic paint, some tapes, even bead work. My base composition is set up for my final oil work, so as all my pieces, it is much layering and excitement in the process. 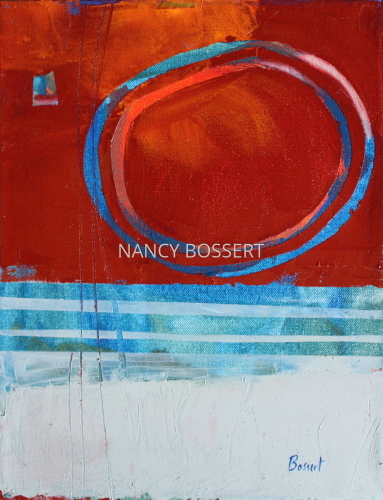 As you view my gallery on Saatchi, the diversity jumps out. If you have followed my work over many years this would be no surprise, or if your read my blog, you might have a better understanding. I am academically educated in fine arts, have taught college and privately for many years. My family understands my passion and I rarely miss a day not being in the studio. I produce and love producing. My biggest problem, and probably not a problem for me, is that once I do two figurative pieces in a row, I need to shake it off because doing a third becomes mechanical for me. I need to shift gears look at the space, or texture, etc. So lucky for me, I also own a kiln. So I might turn to clay, or abstractions, none of which I consider lesser arts. These all make me ME. So if you ask, can I do silversmithing, yes; stain glass, yes; print work, yes; fiber arts, yes ... my mind never stops. So enjoy "Where All Roads Lead" that is my space in the blue and pink. Might look small on the 24" x 24" canvas, but this is a birds eye view. My space is huge. "Pegasus Turns" is an acrylic/ silicone abstract painting on stretched canvas measuring 20" x 20" x 1.5" deep. This painting can be framed, or hung without a frame. It is already wired. 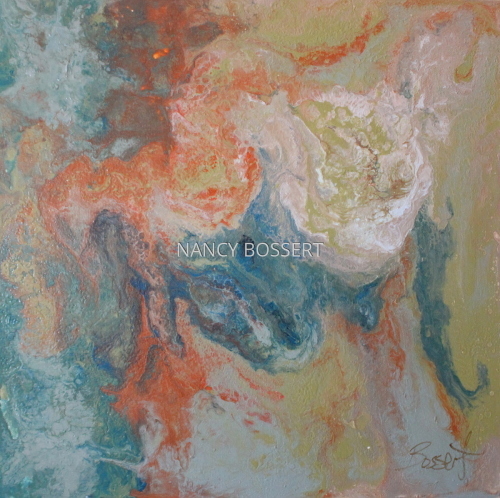 This piece is loaded with color, texture and movement. The color combination encompasses the compliments of blue hues and orange with additions of taupe, ocher whites and more. I view Pegasus jumping with tail upward in more orange. Red Barn is a smaller oil painting on a 6" square stretched canvas. This painting is site framed in a wide, distressed wood frame that has a front profile of 2 5/8" and 1" depth. 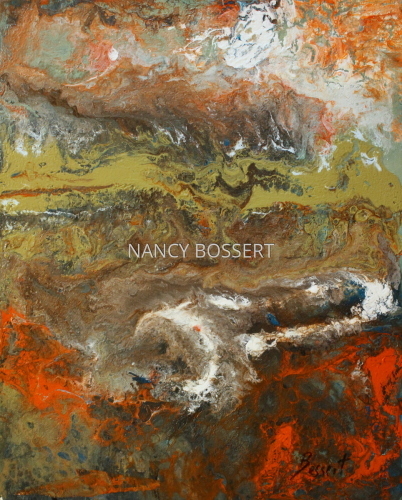 I love the presentation of this abstract landscape. 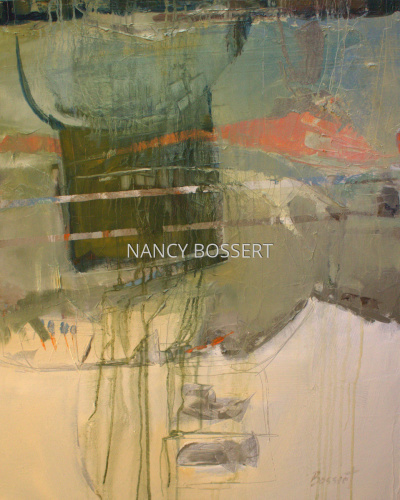 I love dealing with the landscape in abstraction , but also form and the shape aspects within a piece. Coloration is whates, soft blue, red, tan , black and more. The overall size of Red Barn is 11 5/8" x 11 5/8"
Enjoy the movement, texture and scene.